This exquisite collection delivers a perfect morning in a gift curated exclusively for GiftTree by Blackberry Farm. Delicious griddle cake and biscuit mixes are paired with delightfully sweet toppings, like blueberry jam and Appalachian maple syrup. Arranged with premium meats and two pounds of grain and nut granola, this plentiful menu promises to deliver a truly Tennessee brunch. Arranged in a Blackberry Farm collectible crate, this menu is a perfect balance of refined sophistication and homey Appalachian-style comfort. Toasted Grain and Nut Mix. Blackberry, Blueberry and Strawberry Jam. Nestled in the foothills of the Great Smoky Mountains of eastern Tennessee, the gastronomic mecca Blackberry Farm is an artisanal, farm-to-table retreat, complete with a dairy, creamery, salumeria, brewery, heirloom gardens and intimate luxury lodgings. Founded in 1939, Blackberry Farm is situated on an idyllic 4,200-acre estate and is overseen today by former French Laundry Chef and Innkeeper Sam Beall. if ordered by 3:00 am EDT Thursday April 25th. Blackberry Farm Exclusive Brunch Gift is a hand delivered gift. These gifts are delivered by one of our local design centers located throughout the United States and Canada. Same day delivery is available for most gifts when ordered before the cutoff time. 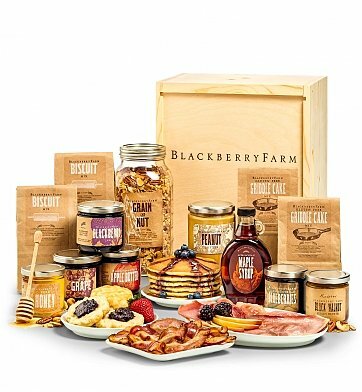 The cutoff time for Blackberry Farm Exclusive Brunch Gift is in the recipient's time zone. Griddle cake, biscuit mix, ham, bacon, maple syrup and more. Items are securely packaged to safeguard the shipping process. Items are gently arranged in a large signature wooden crate.